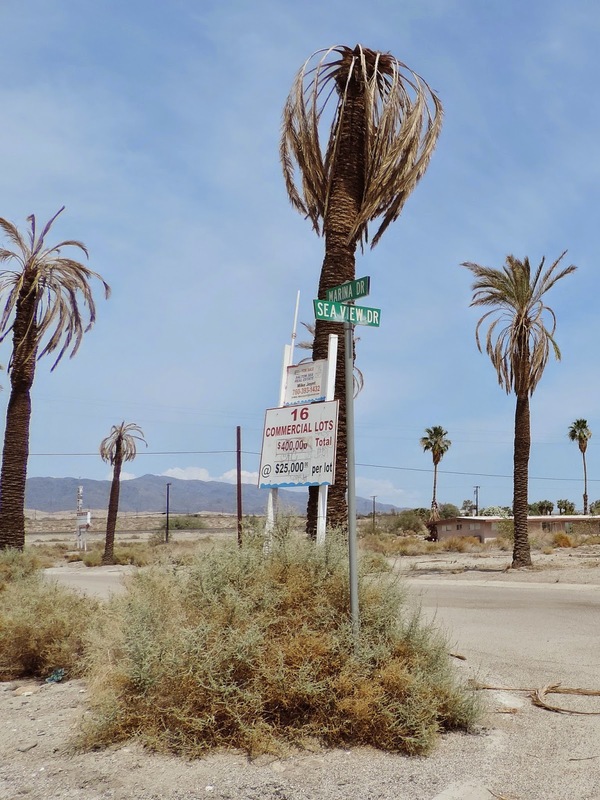 The Cackling Hen: Bucket List Travel: The Salton Sea! 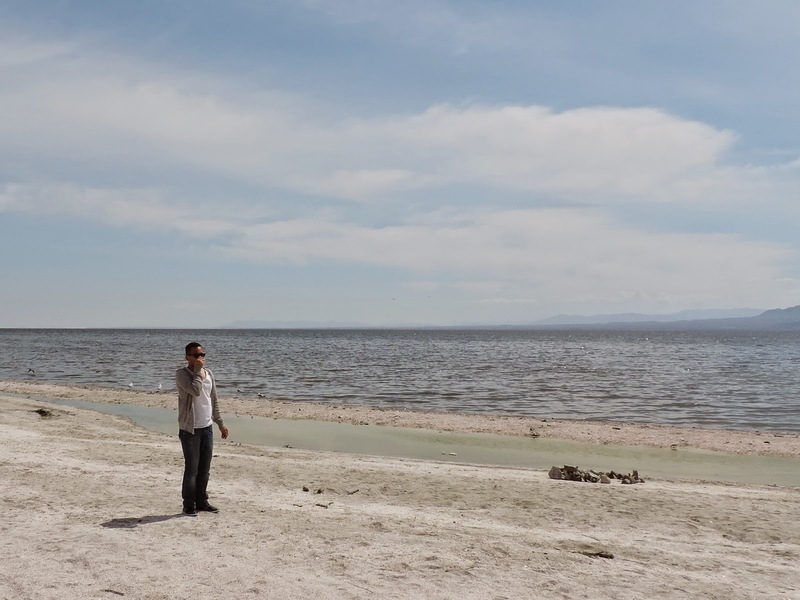 Bucket List Travel: The Salton Sea! When Hens on Ice took us to Ontario, CA, I quickly learned that Ontario and Orange County are not the same place, and Ontario isn't even in Orange County. After a dizzying putter through the outlet mall and coughing on valley smog for 2 days, I craved an adventure. Thankfully, a bucket list destination was just down the road: The Salton Sea. Not knowing the next time I'd return to SoCal, I seized the moment being antsy and tipsy and booked a car to get out of Dodge. I dragged 2 friends along by telling them we were going to Palm Springs and we hit the road. The Salton Sea had been on my bucket list of places to visit since I saw the wonderful documentary Plagues and Pleasures on the Salton Sea in college. It seemed like such a funny place that could be great, funny, and/or horrible to visit, and I vowed to find out personally. Two hours of cement, desert, an wind turbines later, we arrived at the not-so-coveted Salton Sea. I chose to stop at the North Shore Beach & Yacht Club based on both the promising name and that it was the first opportunity to stop on the shore with my disgruntled, full-bladdered friends. Anywhere with yachts had to be decent. rearview mirror at 90 miles per hour, but the lack of toilets tested all of our patience. On the positive side, the absence of people actually meant we could pee anywhere, so we found a good palm tree for the boys, and the cement shell of a former bait, tackle, and sandwich shop for the girls. Public restrooms at the North Shore Beach and Yacht Club. Bladders emptied, we strolled through the dirt and sand toward the water. It was a beautiful day for a walk and swatting buzzing insects away from our faces. The sea was picturesque in the middle of the desert, but 10 feet from the water, a wall of odor slapped us in the face. It wasn't the familiar beach smell of salt, sand, and fun, but rather a smell of rot and decay. When we got closer, we could see at least part of the culprit: dead fish hugging the shore with the gentle tide. At least the birds were seemingly doing okay, and the insects were thriving. This sea was not for anyone with a strong gag reflex. This sea was not for my friend Bryan. My visit to the Salton Sea was brief enough to maintain my friendships in the car, but I also didn't want to stay much longer with my gag reflex. I got my pictures of this beautiful, yet ghostly and rancid place and experienced it first hand. It's no Palm Springs, it's no California Riviera, and sadly for the area that had such promise to be a vacation destination, it never will be. But through the blunders of man and all the area's decay, it's turned into a different destination. It's one of intrigue and oddity, a destination for the adventure-seeker of off-beat places. The beautiful oasis sea in the California desert is about as off-beat and rank as it gets. And lots are still for sale, just as they've been since the 60s. Check out some lovely photos without the smell or bugs! See the full documentary below! Keep reading! "What I Did for a T-Shirt." "THE END OF THE BEST BAND EVER." "Shalom Part II - The Hunger Games."